When canceling, changing the reservation or in a case of no show no refund will be made. 30 days before your arrival. If the cancellation is made later than that, the hostel is entitled to charge total amount of your reservation from your credit card. In case of a no show the total amount of the reservation is charged. 7 days before your arrival. If the cancellation is made later than that, the hostel is entitled to charge total amount of your reservation from your credit card. In case of a no show the total amount of the reservation is charged. Please note that all changes and cancellations are based on availability. When canceling, changing the reservation or in a case of no show norefund will be made. 30 days before your arrival. If the cancellation is made later than that, thehostel is entitled to charge total amount of your reservation from your creditcard. In case of a no show the total amount of the reservation is charged. 7 days before your arrival. If the cancellation is made later than that, thehostel is entitled to charge total amount of your reservation from your creditcard. In case of a no show the total amount of the reservation is charged. Please note that all changes and cancellationsare based on availability. In order to make a booking with us, write your name, address, phone number and estimated time of your arrival. Your confirmation letter will be sent automatically after you have made a reservation. Reservation is compulsory. Reservations made through online booking should be paid when finishing the reservation. In case the reservation has not been paid in advance it should be settled upon arrival at the hostel reception. Please save nature, you don´t need to print confirmation letter! The room is at your disposal from 3pm on the day of your arrival. On your departure day the room must be vacated by 11 am. You can leave your luggage to the hostel. For safety reasons only checked-in guests are allowed on private premises and the maximum capacity per room may not be surpassed. Please let us know your estimated time of arrival at least couple of days beforehand. In order to stay in Hostel Café Koti every guest must have a valid ID with them. We accept the most common credit/debit cards and cash (euros only). We charge all reservations when booking. In case the reservation has not been paid in advance it should be settled upon arrival at the hostel by cash or credit card. Additional services must be paid upon your visit in hostel reception. When canceling, changing thereservation or in a case of no show no refund will be made. 7 days beforeyour arrival. If the cancellation is made later than that, the hostel isentitled to charge total amount of your reservation from your credit card. Incase of a no show the total amount of the reservation is charged. Pets are welcome to stay with us in few rooms. Dormitories aren´t suitable for pets. Well behaving pets and their owners can also join others in common areas. Cleaning fee after a furry friend is 15 euros. There are only certain rooms that are suitable for pets so please notice us always beforehand if you are traveling with a pet. Thank you! The hostel is not responsible for damage or disappearance of valuables whilst your stay. Keep a good care of your belongings. As a guest you are responsible for damage caused on purpose or by accident by you, your guest or your pet in the hostel room or in hostel premises. This applies also to the hostel furniture and other equipment, other guests in the hostel or their property. Hostel Café Koti has rights to charge the costs of caused damages at the hostel from the customer. We charge 5€ fee from a lost keycard and 15€ fee from a lost dormitory locker key. When staying in a dormitory you are assigned to a certain numbered bed. In case you would like to change the bed, always discuss with our staff first about the possibility. In case you change the bed independently, we charge 20€ fee. Our home is your home, treat it with respect! Only a person over the age of 16 is allowed to stay in dormitories without guardian. Families with small children are recommend to book a private room. There are few rooms with possibility of extra bed. Cribs are available on request beforehand (limited quantity). Please notice beforehand. You can book additional services whilst staying at Hostel Café Koti. We offer laundry service (10 euros/load). Room cleaning is not automatically included to short term reservations, please ask about our cleaning services from our reception. We prefer arrivals before 9pm but late arrivals are also possible if noted at least one (1) day before. Our reception is open daily 7am until 9pm. If you book at least three (3) rooms / beds or more, please kindly inform the names of all the guests in advance by e-mail. Hostel Café Koti reserves the right to change room rates, terms and conditions. 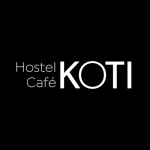 Hostel Café Koti is situated in the heart of city center of Rovaniemi. The building of Hostel Café Koti was originally built as a bank. In the renovation entrepreneurs wanted to maintain the original strong feeling that rises from the strong and massive elements and spice it up with a cosy and modern touch. 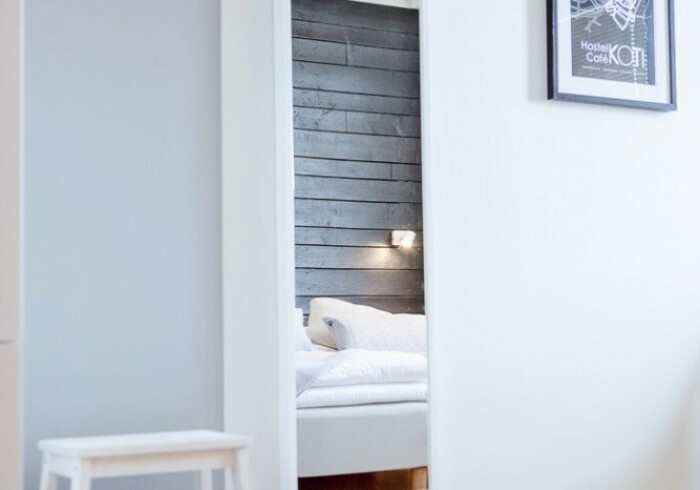 The ambition is to offer our guests warm, relaxed and authentic experience of the city of Rovaniemi. The Hostel Cafe Koti is run by the owners Antti and Tuulia, friends who share dream. While travelling around the world they learned to appreciate home much more and look at it from a new perspective. Now, they want to show their hometown to people as they experience it: pure, warm-hearted and relaxed city on the arctic circle. We have 24 rooms and 3 dorms in our hostel, altogether 84 beds. Rooms have their own bathrooms and light breakfast is included in the room price. There is a equipped kitchen, a cozy relaxing area and also a genuine Finnish sauna at guests use. Spacious Café Koti is on the street level and it has big windows with a great view to the downtown streets of Rovaniemi. Café is suitable for about 80 persons. We want the café to be a comfortable space which offers a relaxing break from the city buzz. We organize small events and happenings on selected evenings in the café which connects the travellers and locals. Also, small art exhibitions will be held in the café from time to time.